A neglected 19th century bakery complex has sprung back to life, but this time it’s not for baking bread. 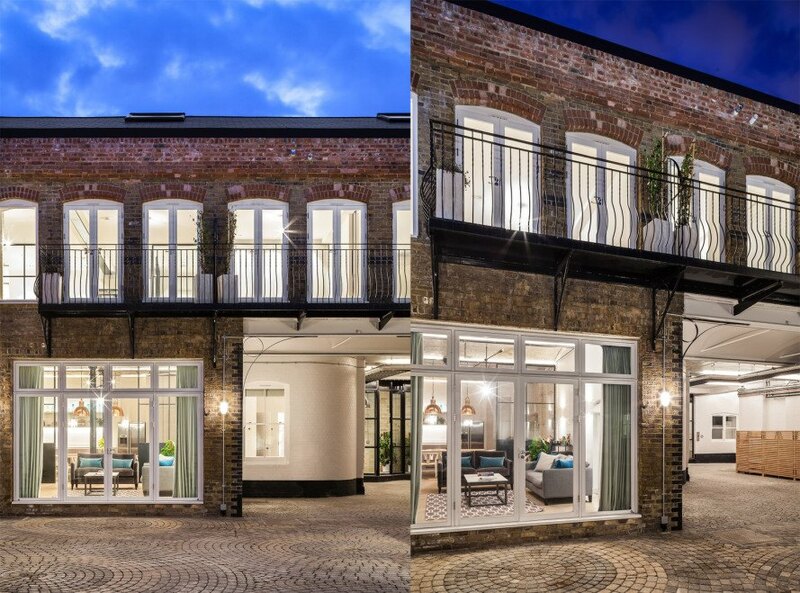 Jo Cowen Architects gutted a series of historic bakery buildings along with adjacent stables, a lodge, a granary, and a coach house in Clapham and revamped them into a modern luxury housing development known as Bakery Place. The architects preserved many of the original building elements and combined them with contemporary design for a sophisticated, modern industrial vibe. Originally built in 1898, the newly renovated Bakery Place comprises a 12,000-square-foot Victorian-era site with three main buildings: the Bake House, the Lodge House, and the Coach Houses. Jo Cowen Architects transformed the buildings into 11 unique residential units that blend the buildings’ original history with comfortable modern living. 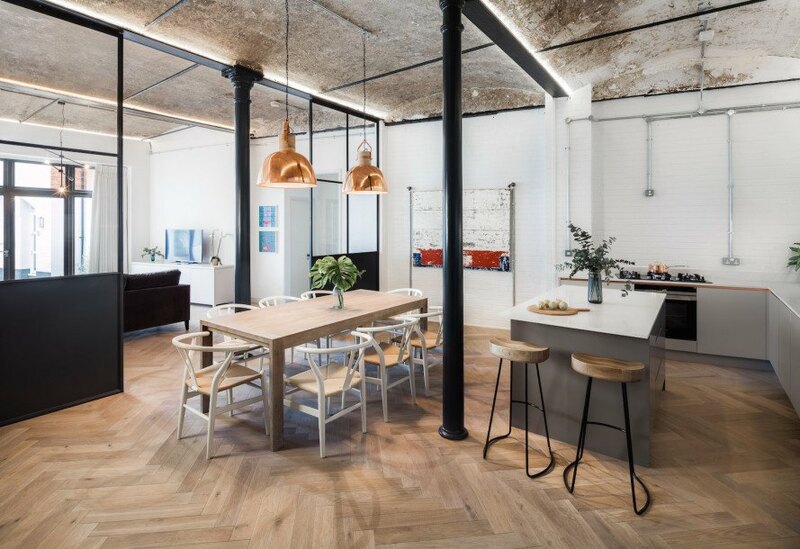 Exposed brickwork, cast-iron columns, and cobblestone are paired with bright white-painted walls, light herringbone timber floors, and contemporary minimalist furnishings with an industrial-style twist. “Our vision for the scheme offers a contemporary and distinctive living environment that celebrates the history of the original buildings,” write the architects. “Our design blends the old and new with carefully selected and positioned materials used to draw attention to the detail and craftsmanship of the original.” A major element of the revamped buildings is the increased access to natural light, which pours through modular glazed screens and skylights. Double-height spaces draw daylight to the ground floor and create a spacious and airy feel. Interior designer Amelia McNeil and lighting firm Studio 29 also collaborated on the interior design. Originally built in 1898, the newly renovated Bakery Place comprises a 12,000-square-foot Victorian-era site with three main buildings: the Bake House, the Lodge House, and the Coach Houses. Jo Cowen Architects transformed the buildings into 11 unique residential units that blend the buildings’ original history with comfortable modern living. Exposed brickwork, cast-iron columns, and cobblestone are paired with bright white-painted walls, light herringbone timber floors, and contemporary minimalist furnishings with an industrial-style twist. A major element of the revamped buildings is the increased access to natural light, which pours through modular glazed screens and skylights. Double-height spaces draw daylight to the ground floor and create a spacious and airy feel. Interior designer Amelia McNeil and lighting firm Studio 29 also collaborated on the interior design.